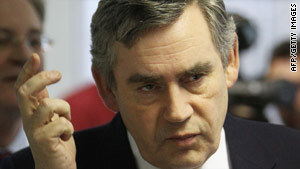 Prime Minister Gordon Brown says the measures are intended to increase British security. London, England (CNN) -- Britain is expanding its security watch list and has suspended all direct flights to Yemen as part of a series of new counterterrorism measures, Prime Minister Gordon Brown announced Wednesday. The watch list also will be used as the basis for two new lists, Brown said -- a no-fly list and a larger list of those subject to special measures, such as enhanced screening before they board a flight. The measures are intended to strengthen British security, enhance counterterrorism work and maximize the security of air travel, Brown said. He said the failed Christmas Day attack on a flight bound for the United States, in which a Nigerian citizen allegedly tried to bring down the plane with explosives hidden in his underwear, highlighted the widened reach of the Yemen-based group al Qaeda in the Arabian Peninsula. The group has claimed responsibility for that attack. Brown said it also showed the need for greater cooperation among nations to counter the terrorist threat, and the need for greater detection of explosives hidden anywhere on the body. "As with all aspects of the fight against terrorism, this new threat can be met only through enhanced cooperation," he said. Next week, as London hosts a conference on Afghanistan, there also will be a meeting to strengthen international support for Yemen in its efforts against al Qaeda, Brown said. "The action we are taking to counter terrorism at its source in the Afghan-Pakistan region and elsewhere is a central part of our wider counterterrorist strategy," he said, "and all our actions, which we will update regularly, are founded on what is and must be the first and most important duty of government: the protection and security of the British people." Al Qaeda's affiliates and allies are increasingly trying to exploit areas like Yemen and Somalia that have weak governments, Brown said. He said that has made Yemen both an incubator and potential safe haven for terrorism. "I can today inform the House that we have agreed with Yemenia airlines, pending enhanced security, that they suspend their direct flights to the UK from Yemen with immediate effect," Brown announced. "We are working closely with the Yemeni government to agree what security measures need to be put in place before flights are resumed. Aviation security officials are in Yemen at present looking at this and I hope that flights can be resumed soon, but the security of our citizens must be our priority." E-borders, a British government program to strengthen border security, is getting a £1.2 billion ($1.95 billion) investment to enable all passengers traveling through any major British airport and port to be checked against the watch list, he said. Britain is pushing for agreement with its European Union allies to share passenger records, he said, and it is investing in stronger security measures at British airports. "It is because we fully recognize the global nature of the terrorist threat we face today that our response must also be truly global," Brown said. "Plots against the UK and our interests originate in various parts of the globe."